HATHA YOGA .. what is hatha yoga? what is YOGA NIDRA ? Dec 2017, Festival of Lights and Good news ! The Yunus Emre farm, Yogic and Ecological farm, What is it ? Why ? This course has been for all of us as intense as the Satyananda Yoga. Here is the full article. Here are the photos. Sannyasi ATMATATTWANANDA is Satyananda Yoga teacher since around 30 years. She has been regularely teaching in the Bihar School of Yoga, home of the Satyananda Yoga. Now she is managing the Satyananda Yoga European Academy which offers high level training in Yoga following to the pure Tradition. There we can undertake Yogic Studies and Yoga teacher training course for example. She accepted to come FREE for this exceptionnal course in the Yunus Emre farm so as to support the farm and let the Satyananda Yoga be known in Turkey. Thanks to her the course could be free of charge. Beautiful ideas indeed. Everyone looks after everyone, Everyone’s needs being respected and fullfilled! Consensus leads to the free flow of each individual’s mind. This individual mind being mostly ego-centered, where does this lead ? If people have been working on themselves, if they happened to learn about the mind’s terrible tricks and functionning, then yes it may work for some time. Time to realise that there is a “Higher Authority” which we cannot escape. This word makes us run away. “No Religion ! no Slaveholder “! shouted the anarchists. So many images, so many emotions, such heavy individual stories are bound to this simple word. We are moulded in this history. Even our education is moulded in this history. Yet let us take a closer look at this 8 letters word. And let us just imagine that however rebel outlaw marginal we may have been – or we still are..
Let us just imagine that ... whatever we do whatever we think there might be a “Higher Authority”, and this “Higher Authority “ could be above ALL, could govern everything, Cosmos, the Universe..
Let us just imagine that this “Higher Authority” could be just .. LOVE. Now let us watch the Great Nature, Mother Nature, and Nature’s Order. Like smart beginners in permaculture, having emptied ourselves let us just OBSERVE Nature. Let us observe once this incomparable order, this inimitable order, Nature’s order. Because in the Nature a giraffe would not try to become a snail! Neither would a frog try to become a ox ! In Nature every element, every parcel of Creation comes to birth, grows, lives and dies following Nature’s order, Nature’s laws, Nature’s Authority. And even if this order looks sometimes destroying, no one in Great Nature tries to oppose to Nature’s order. No one ? except ... human, Human being who believes he is stronger than Nature. Yes the Nature’s forces of law and order. Maybe again these words could be like taboo for some personnal reasons..
Let us blow away our personnal stories our personnal emotions and mind flow. And this order generates forces. And these forces create Nature’s cohesion. As long as we oppose to Dharma we are in “Adharma”, against Nature and thus leading towards chaos.. just like we do in the present times. Now let us stop for a while. Let us feel LIFE inside us, the Life’s force inside us, let us feel this incredible life’s cohesion inside us, let us feel just grateful and humble towards such magnificence, towards such a huge fantastic mystery, the Life’s mystery, the Great Nature’s mystery...Nature LOVES us. Yes. With universal and unconditionnal Love. This Universal Love that makes the Soul grow. “ I love you if you love me” No ! Universal Love is UNCONDITIONNAL. It is HERE. That’s it. It doest not change with changing emotions or weather‘s mood. It is here, unchangeable, immovable. And it is HERE in US , IN ALL OF US. And we have to find it. In us. We have to understand that Nature’s guidance, Life’s guidance is only LOVE, eventhough sometimes the experience is painful. We must know that each and every experience that Nature gives us is here for our GOOD and for our soul’s growth. We must be absolutely convinced that Nature only acts out of LOVE. Surrender to Mother Nature, to Her power, Her force, Her authority, because She is hugely far more evolved than we will ever be, because She knows all the secrets that we will never know. Then we can feel how soft, how fantastic it becomes to just let GO, to just abandon our life to Great Nature’s Authority, to Mother Nature who is only Forgiveness, Compassion, Tolerance, Infinite tenderness, who is only LOVE. If we manage to feel this, then the concept of Authority just melts and merges in the infinite Ocean of LOVE. 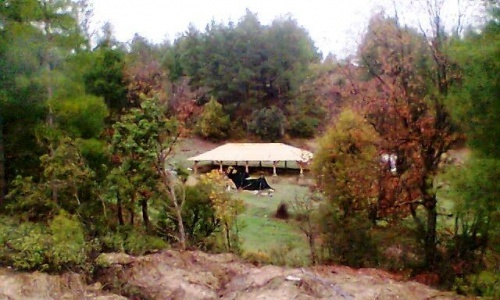 The Yunus Emre Farm, yogic ecological farm, what ? why ? What is the place, the role of the Yunus Emre farm regarding all that ? The Yunus Emre farm is first of all a Yogic place based on the Yogic teachings. Because Yoga is a spiritual teaching that allows us to unite with Nature, with Mother Nature. Because thanks to the Yoga practices we learn and understand how we function, and specially how our mind functions. Because Yoga shows us clearly that although we may feel “free” when acting as a rebel for example we are actually only the slaves of our mind and its functionning. We are only acting out of reactions to our past history traumas and memories. Because Yoga opens our eyes, specially the third eye – yes it exists ! It is called “Ajna” and this third eye allows us to really SEE our functionning, and to reconnect with our inner Nature, with our Soul, and thus with Mother Nature. This is Ajna which permits us to SEE through the veil of ego, through the veil of Maya- illusion, and to see the true dimension of life, the Transcendental dimension. This is Ajna which brings us VIVEKA, DISCRIMINATION which will allow us to discriminate between our ego- desires and actions ( mostly responsive) and the desires and actions coming from Atma the Soul, which will be creatives. Then we will realise that we are only the slaves of our ego and mind. Ego and mind are of course absolutely necessary to our lives but they are so limited. And at this point we will realise that instead of being free we are only in the ego’s prison. Then we will understand the value of “Surrender”, surrender to Great Nature, surrender to the Higher Nature, and how precious it will become because only thanks to Surrender we shall become what we really ARE. Only with Surrender we shall become FREE. This is what Yoga offers to human searching for TRUE FREEDOM. So in the Yunus Emre farm, not only we can practice yoga to improve our physical heath, to calm down our mind and manage our emotions, but we can also go further in experiencing the Yogic life style to go deeper in the discovery of life in the quest for liberation. In the Yunus Emre farm EVERYTHING is Yoga. From morning practices to evening when we go to bed, everything is Yoga because in every action we put AWARENESS. Awareness is the KEY to evolution. This is the key to feel this “awareness of being conscious”. This is the key for expansion of consciousness. That is why in the Yunus Emre farm there are a “daily routine” and rules to be followed which match with the Yogic life style. And there is even ... an “Authority” ! because they are all same. Because the Guru is the one who dispels the darkness which we live in. Because thanks to the Guru we become able to feel again our inner Light. So in the Yunus Emre farm we are under the authority of our Guru, of the Universal Love, of Mother Nature, of the Divine. From mid april 2011 the Yunus Emre farm will reopen and offer you in its totally natural environment Satyananda Yoga retreats and week ends. There will be specific periods during which you can book for at least one week ( no maximum limitation!) to stay in the farm and imbibe deeply with the yogic life experience. You will be under the guidance of Sannyasi Yogapushpa who is also Satyananda Yoga teacher and you will discover the powerfulness of the however simple yogic life. You will like this acquire means that you will be able to use again when you go back home (like Yoga nidra for example) and that way you will be able to much better face the ups and downs and day to day difficulties of life. You will be able to much better manage the stresses that we experience in the modern life be it at a physical emotionnal mental or spiritual level. In short you will become less affected by the difficulties of the modern life, yet continuing to be totally imbibed in it. Because Yoga is not to be lived in a cave but to be applied in the day to day life. Yet one yoga course in a week is not enough to learn this. That is why such retreat period becomes a must that you can offer to yourself, to your body, your mind, your spirit. Dont forget that by looking after yourself, your look after others. The good that you do to yourself will be reflected onto others. The program of these retreats will be simply ... the yogic life. You can read the article about the yogic life HERE. These retreat periods are mostly destined to people living abroad from Turkey who could hardly come for only one week end .. But of course people who live IN Turkey may also come ! Monthly there will be 2 Satyananda Yoga week ends, from Friday evening to Sunday evening, come and imbibe the yoga spirit, offer this break to your body mind spirit. The precise calendar for theses week ends and retreat periods will be communicate later on. However if you have questions, if you wish to already book a specific period please let us know. Contact us. English, French and Turkish are spoken in the Yunus Emre farm.